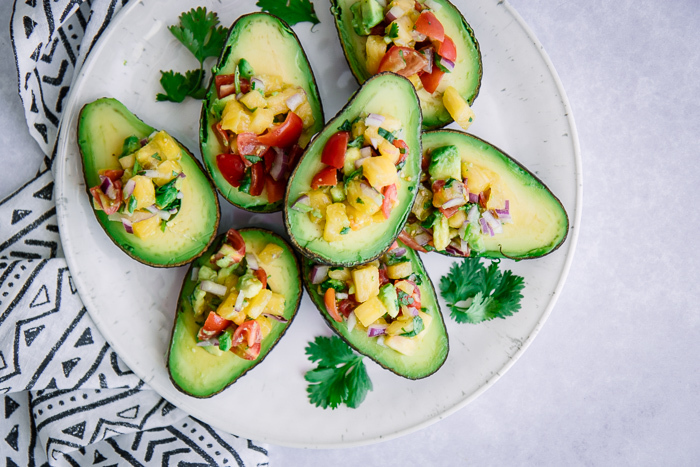 Pineapple Pico de Gallo Avocado Cups, simple healthy plant-based superfood salsa recipe featuring fresh pineapple, tomatoes, onions, cilantro, and lime stuffed in an avocado. Perfect for parties and picnics! Are the kind of person who attacks the salsa when it hits the table, or is that just me? I could very well do without ordering an entree when ordering Mexican food because I can (and often do) stuff myself with chips and salsa. For this reason, I don’t often make salsas at home but recently decided to ditch the salty tortillas chips and instead serve my salsas and pico in a natural bowl–an avocado! 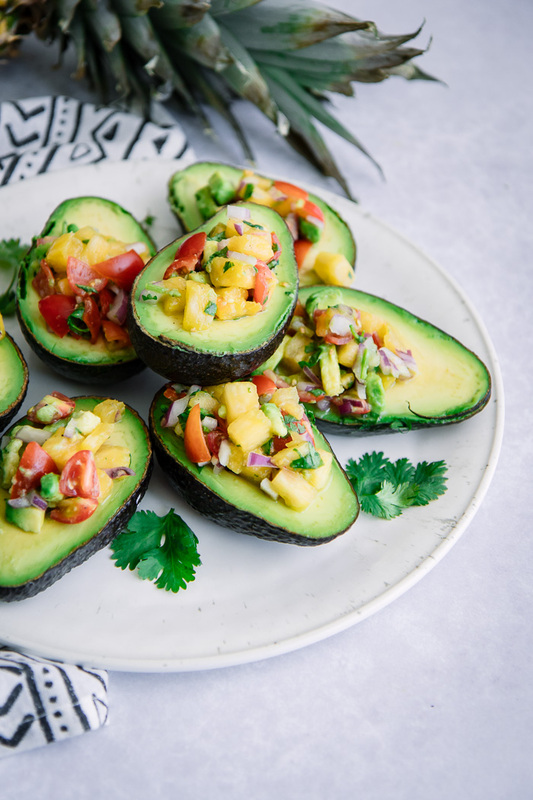 If you LOVE pico de gallo as much as I do, then this simple Pineapple Pico de Gallo served in avocados in the perfect recipe for your next party, picnic, or barbecue. 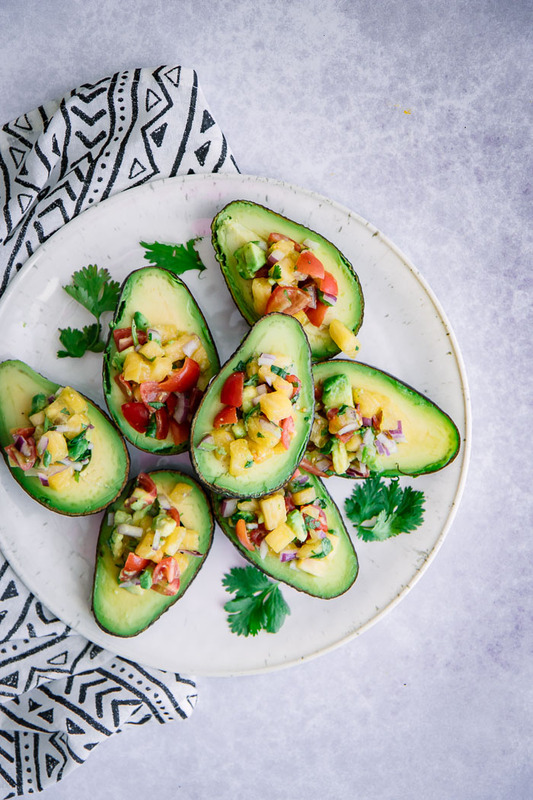 Using one full medium pineapple mixed into a tomato, onion, and cilantro pico, this superfood plant-based pico will be your favorite summer appetizer. Ready to make this super simple pico de gallo recipe? Vamos! What is pico de gallo and is it a salsa? Salsa is the catch all phrase for any type of Mexican sauce, as the spanish word salsa literally translates to sauce. However, even though traditional Mexican salsa usually has the same ingredients as pico de gallo and all pico de gallos are salsas, not all salsas are picos (confused yet?). Mexican salsa can be fresh or cooked, and can have a thick or thin consistency. Pico de gallo, or salsa fresca, is a salsa made from fresh (uncooked) ingredients and usually has a thicker, chunkier consistency that is not blended. This pineapple salsa uses freshly cut fruit and vegetables and does not blend, which make it a pico de gallo. How do you make pineapple pico de gallo? The great thing about pico de gallo is that it is so simple! The ingredients are simply chopped into small pieces of similar size and mixed together before serving. 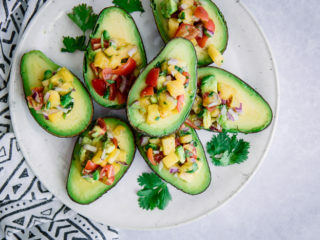 This pineapple pico de gallo uses fresh tropical pineapple, tomatoes, red onion, cilantro, lime juice, salt, and pepper and is served in a half avocado as a small cup. Just cut, mix, and serve! Recommended tools: There is no specific kitchenware that is needed for this pineapple pico de gallo recipe, however a good set of quality kitchen knives, a nice cutting board, and a set of glass storage bowls are recommended for making and storing. Are you loving this easy vegan appetizer recipe? Try out our Healthy Baked Patacones and Warm Marinated Olives, two more simple plant-based snacks and starters. Did you try this Pineapple Pico de Gallo recipe? Make sure to leave us a comment and recipe rating below to share your thoughts with us. Save this recipe for later by pinning to your favorite appetizer Pinterest board and don’t forget to tag us on Instagram so we can see your pico de gallo creations! Add pineapple, tomatoes, red onion, cilantro, lime juice, salt, and pepper in a large bowl and mix well to combine. Serve inside cut avocado halves with tortillas chips, guacamole, on tacos, or as a garnish on soups. Enjoy! Leftovers & Storage: Store the pineapple pico de gallo in an airtight container in the refrigerator for up to four days. Freshly cut pineapple will release a lot of liquid after it has been allowed to sit, so you may need to drain it or mix the salsa together again before serving. For the best avocado freshness, cut right before serving. Nutrition: This fresh pineapple salsa recipe is a healthy plant-based appetizer than is low in sodium, cholesterol, and saturated fat and high in potassium, fiber, and vitamin C. The sugar content is naturally occurring. It also contains avocados, which are high in healthy fats and increase satiety. Yes, chips and salsa is definitely the tradition but I thought using avocados as a small bowl would be a fun twist. I’m glad you liked it, I’m loving fruit salsa lately on tacos and fish. very useful recipe for vegan people, all types of person. thank for sharing. I”m glad you thought so, thanks so much for stopping by!